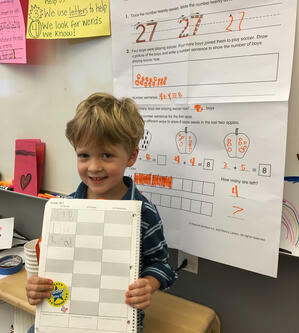 “It starts with engagement; that’s where the joy of learning comes in.” According to Kindergarten Expert Teacher, Ms. Hodges, her philosophy lies in creating opportunities for students that are not only academically important, but also engaging and fun. The reward comes when she sees rigorous learning happening without them realizing it. 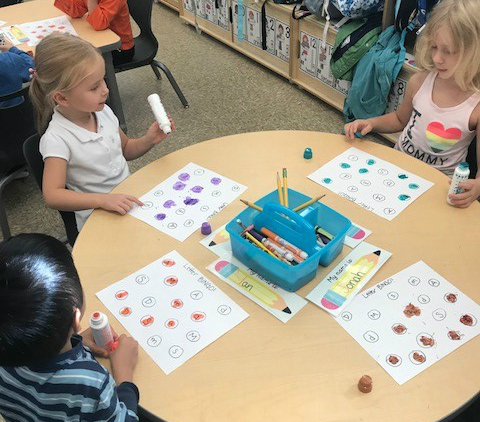 BASIS Independent Manhattan allows for flexibility in the curriculum in Kindergarten and Ms. Hodges takes full advantage of her autonomy to build and tailor a specific experience designed to draw in her students and guide them to meaningful learning. 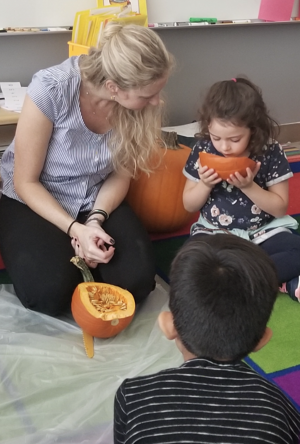 For example, during one of her 50-minute Enrichment periods, Ms. Hodges conducted a pumpkin exploration to connect art, math, and science in a hands-on activity that kept the interest of her students while they acquired new skills and knowledge. The students could hardly wait to dig in! Before carving and scooping out the pulp and seeds, they compared two types of pumpkins and measured them with unification cubes to show their size differences. Next, they hypothesized if the pumpkins would sink or float by dropping them in water to test their buoyancy. To have fun with math, they took out the seeds and practiced place value and counting by 10s to get a grand total of 440 seeds! Lastly, the students created pumpkin diagrams, labeling all of the gourd’s parts and recreated these as art pieces using sharpies and watercolors. 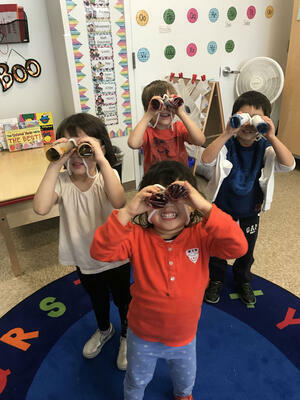 This exposure to academic topics in various, hands-on, and engaging activities is an interdisciplinary approach that is visibly present in our PreK classes as well. Early Education Expert Teacher Ms. Hendrickson gets her students excited about learning by starting lessons off with a song, using manipulatives like counting bears, and taking dance breaks throughout the day. Specifically in PreK, classes will do a daily letter sound practice, where the students look at a card and say the letter and its associated sound. To make sure her students are acquiring this knowledge, Ms. Hendrickson checks for understanding with “Do-a-Dot” Bingo. Students use the paint markers to fill in a bingo card with the letter that they hear their teacher say. It’s a hands-on activity where the kids have fun painting and are excited to win prizes. Ms. Hendrickson relishes moments like these as a teacher, when she is rewarded with smiles from her students who don’t even realize that she was trying to find out what they learned. For Ms. Hendrickson, the greatest reward is when she sees her students apply learning to the world around them. One day shortly after learning AB patterns in math, one of her students welcomed a classmate that morning by saying, “You have an AB pattern on your shirt!” At that moment, this student connected the dots between what was learned in math with the child’s striped shirt and reinforced the topic to the rest of the class with that observation. With their daughter now in grade 1, they can see how BASIS Independent Manhattan has given her a new level of confidence, socially and academically. One personification of this shows in her ability to work through homework with noticeably more independence than last year. Based on what they’ve witnessed with their daughter, Laura and her husband watch their son’s development in PreK with confidence, knowing the incredible path that lies ahead of him. We are currently accepting applications for PreK through grade 8. Submit an application today.